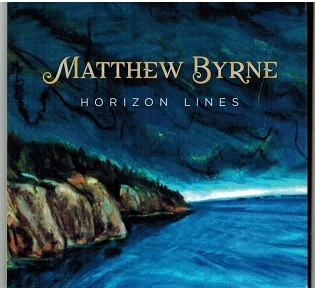 Matthew Byrne from Newfoundland released his highly anticipated third album, Horizon Lines in August 2017. The Album was nominated for an ECMA 2018 Music Award for Roots/Traditional Recording of the year. The album is a collection of traditional material and explores a unique repertoire of songs from both sides of the Atlantic and continues Byrne's journey through his own unique musical lineage-the weaving of a great story with a beautiful melody-and he supports this tradition with powerful vocals, polished guitar work, and a presence that fills a room. The album was recorded, engineered and mixed by Billy Sutton (The Fables) at Sound Solution in St. John's, NL and mastered by Jason Whelan at The Sound Solution. Michael Byrne has established himself as one of Canada's most authentic and vital traditional voices.Storytelling through song is a fundamental duty of traditional music and Matthew Byrne does this brilliantly with his latest recording, Horizon Lines. Atlantic Seabreeze gives the fine album a 5 Star rating out of 5 stars. Matthew is the finest interpreter of traditional songs in the country. For more information regarding Matthew and his music, refer to his website, address posted above.